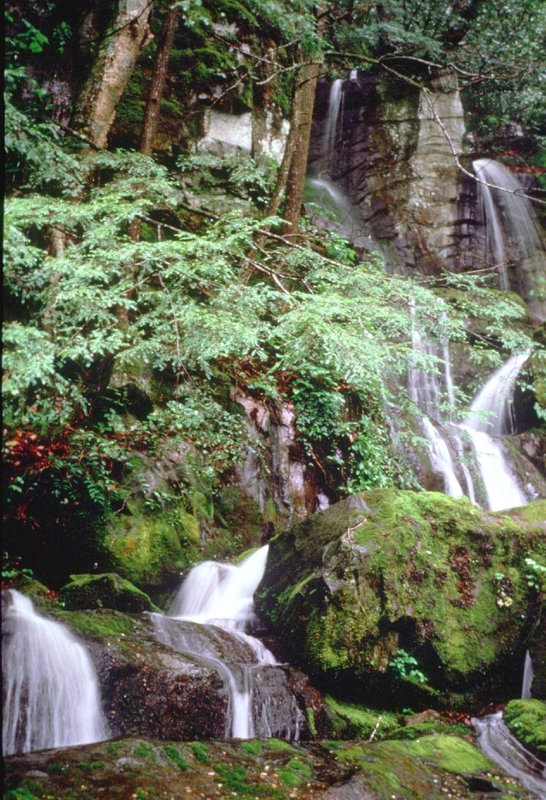 There are only two waterfalls in all of Great Smoky Mountains National Park that you can drive to, and one of them is called Place of a Thousand Drips. This waterfall is so named because it’s a lacework of many small waterfalls rather than one big one. It’s an easily missed sight, visible towards the end of the scenic-drive loop of Roaring Fork Motor Nature Trail. Thousand Drips has a variable flow and is at its best during rainy times. It can slow to a bare trickle and increase to a strong flow, depending on the weather. The many rivulets and runoff courses have worn grooves and channels into the tumbled rocks of the hillside, and during wet times the green moss with the sparkle of all the different waterways is a sight well worth catching. Roaring Fork Motor Nature Trail is a narrow, winding road up and down hills with spectacular scenery that you can see from the car. It’s a one-way system that you get to from Traffic Light #8 in Gatlinburg. Driving into the Park, you enter the Trail, which goes on for 6 miles and loops you back into Gatlinburg. The Trail is a slow drive, a self-guided car tour with many attractions along the way. Towards the end of the drive, at Stop #15, on your left look for the waterfall. There’s pull-off parking on the right just past the falls. There will usually be people around, absorbed in their cameras and viewfinders, so be careful as you drive, and careful for yourself if you park and walk back, with cars coming down the hill towards you and focused on the valley view. Taking photographs of moving water is an art in itself, and photographers use a tripod and a long exposure to get that brushed, flowing look. Regardless of your camera or skills, do plan to take a picture here, it’s a memory you’ll want to keep. A short video is another good way to capture a waterfall. 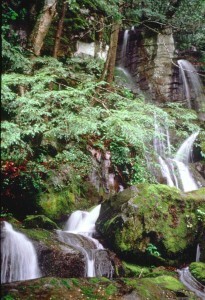 Waterfalls are one of the most attractive features of Great Smoky Mountains National Park, which receives abundant rain and snowfall, and has a multitude of streams. Most waterfalls require at least a gentle hike to get to, but Place of a Thousand Drips is a gift for those who can’t hike or have no time.